I’ve had a Dell XPS for a few years. Upgrading laptops hasn’t ever really been that exciting to me. Sure, some iterative benefits, but for the most part I’ve always experienced massive hassles during the upgrade experience with software and devices. I got my first laptop, an IBM ThinkPad, in 1998. This is pretty much the first time I have been excited about a new laptop. Well, maybe my Toshiba Tablet PC (2002?) was also an exception. But it was buggy and the stylus didn’t work as well as I expected. OK, so I haven’t really been excited at the concept of a laptop upgrade and the XPS was doing just fine, even though I had blown the left pad key studying for the CFP ™ Board exams few years back (from all the mock tests). I planned on upgrading in 2012 to take advantage of the smaller form factors for laptops though, and when I found out about Ultrabooks I knew that was what I wanted. I had also planned on upgrading my monitor to a 27″. I decided to check out the Ultrabooks while picking out my monitor at Fry’s (I got an ASUS monitor with HDMI, 27″). 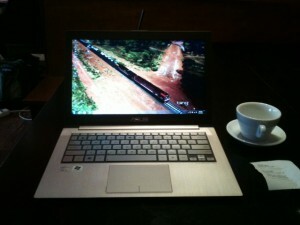 I had seen photos of the ASUS Zenbook UX31 but I fell hard when I saw it in person. I loved everything about it: The brushed metal lid, the Chiclet keyboard, B&O speakers, 5 hour battery life, the solid state drive, the profile, it’s thinness, USB 3.0, HDMI. When picking out where to buy it, I was pretty partial to buying from a local store in case I had any random questions about it. The Microsoft Store near my house had it for the same price ($1099) and threw in a $200 gift card, which I used towards Microsoft Office 2010. Everything from unpacking it (not just a brown box, it was an elegant black box with tabs to pull everything out, and very well presented) to powering it up to installing software, it was the most seamless, least painful laptop upgrade I have ever had. It has usually taken me a couple days on and off to get stuff transferred (I am talking to you Outlook and your .pst local files) and all set up. But this! It truly was an out of the box experience and turnkey. That is the first time I think I have ever used the word turnkey with a new laptop experience! Its absolutely gorgeous! 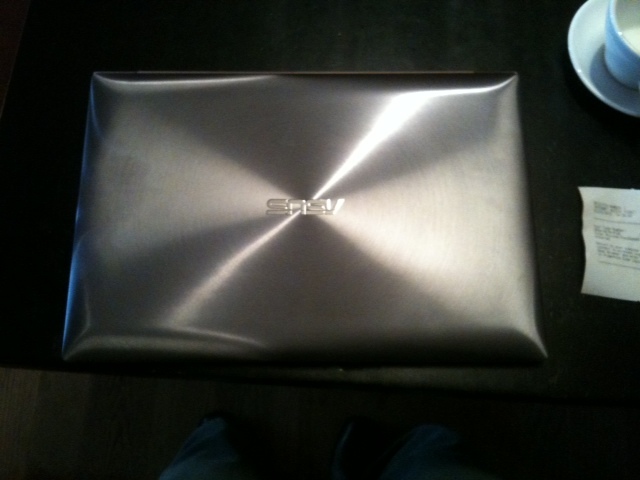 It has an Intel Core i5 and it has Microsoft Windows 7 (same with my Dell XPS, but it’s faster on my ASUS). It came with it’s own sleeve that is copper and has an envelope closure. So it’s not just another blah black zippered sleeve. The battery life is proving to be ~ 5 hours depending on what apps I am running. And kudos to Windows 7 as it found all my devices without me having to go find any drivers, and that includes an old HP printer that serves as backup. I am very happy with it, and my iPad 2 (which I only got this last Christmas) has been a bit marginalized now, as I prefer this form factor by far even for what I was using the iPad 2 for (reading, email, light tasks, Pinterest addiction, etc. ).